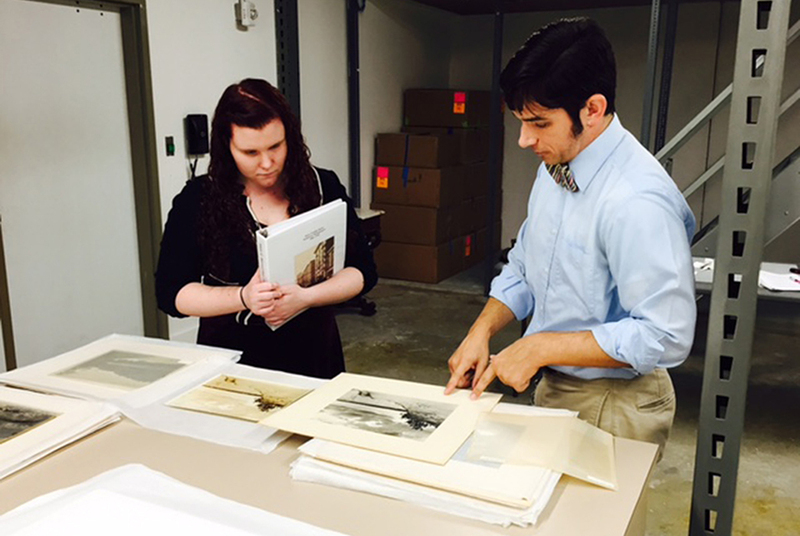 Stephanie Deach, left, Virginian Wesleyan College Public History Intern and Alex Mann, Brock Curator of American Art, review photos for the Harry Cowles Mann exhibition. Photo by Kathleen B. Casey. NORFOLK, VA.- A new exhibition of photographs from the collection of the Chrysler Museum of Art transports viewers back to Norfolks boom years at the turn of the 20th century. Opening to the public April 16, Harry C. Mann: Norfolk Photographer, features 50 photographs on display at the Willoughby-Baylor House in downtown Norfolk. Between 1907 and 1924, Harry Cowles Mann (18661926) chronicled the changing face of Norfolk. The Petersburg, Va. native learned the craft as one of many photographers producing commemorative images of the 1907 Jamestown Tercentennial Exhibition. Within a year, he opened his own studio on the corner of Main and Bank Streets in downtown Norfolk. While his business revolved around portraiture, this show explores his creative endeavors as a city and landscape photographer. Mann was in the right place at the right time. Norfolk experienced a building boom of skyscrapers between 1890 and 1920, and Mann was there to document the new skyline. His photographs of Norfolk life include a view across the Hague into Ghent, captured from the roof of the eight-story Botetourt Hotel (opened in 1907, now the Botetourt Apartments) and a picture of businessmen, shoppers, and sailors strolling past the new Lorraine Hotel on Granby Street (also completed in 1907, most recently operated as the Tazewell Hotel). In addition to his architectural photographs, the exhibition includes his more artistic experiments with shadows and light in landscape photography. He climbed the dunes from Cape Henry to Nags Head, creating striking images of windswept sand, crashing waves and painterly streaks of clouds against the sky. The exhibition was curated by Brock Curator of American Art Alex Mann (no relation), who first explored the Museums collection of Harry Mann photos in 2014 while reorganizing displays for the Historic Houses on Freemason Street. Working with an intern from Virginia Wesleyan College, senior Stephanie Deach, Mann selected the 50 finest images from the collection. Deach discovered Manns history of publication with National Geographic magazine, and thanks to her research, the exhibition includes several vintage issues, showing the photographer was reaching a global audience. Harry C. Mann: Norfolk Photographer will be on view from April 16, 2016 to April 2, 2017 at the Willoughby-Baylor House, 601 E. Freemason Street, Norfolk, Va.